On August 21, 2017, “The Great American Eclipse” swept across the United States from Oregon to South Carolina. 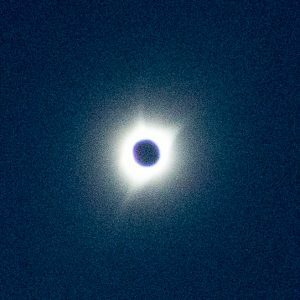 As it happened, the Zone of Totality – the geographic strip where the moon would fully block the sun – crossed just 200 miles south of us in southern Idaho. I had heard stories of inspiration, endorphin rush, and total bliss from people who had viewed the corona of a full solar eclipse. I decided this was an opportunity too good to miss. I was right. In under 90 seconds, the eclipse unexpectedly changed my life. This summer has been an overload of fire energy – with unseasonably hot and dry weather in the northwest, numerous intractable wild fires, gusty and changing winds, choking smoke, and on the human front, increasing countrywide reactivity, bullying, and violence. 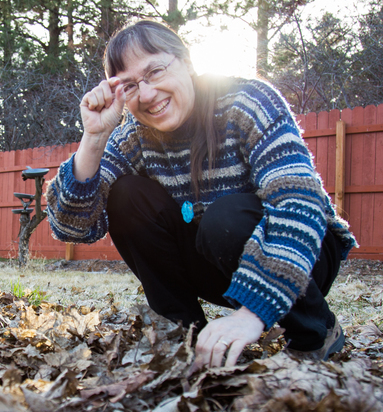 I’ve found myself battling unprecedented plant and animal pests in my garden, not to mention the first-ever appearance of “slime mold,” which is neither animal nor plant! (It is a single-celled organism the size of a dinner plate which is both fascinating and creepy at the same time.) With limited yard time over the past two months, I found myself spending more time checking the news, weather, and fire/smoke reports than my own creative work. I was low-energy, cranky, and stalled out as my husband and I started our trip south. The next morning, of course, went without a hitch. Traffic was lighter than expected, and we arrived at our turnoff for the Little Lost River area (a broad agricultural valley ringed by mountains) well ahead of schedule. As soon as we entered the valley, all traffic disappeared; we saw perhaps a dozen vehicles and a pair of antelope on our 45-mile journey south. I had been particularly concerned about finding a place to park by the side of the road (there were no towns where we were going) without the worry of starting a grass fire or being told to move along. (The suburban me was secretly hoping for a parking lot, even as the Montana me was craving the wide open spaces.) During my restless night before, I had asked the spirits to give us a fast and easy stopping place in the morning so I could enjoy the trip without worry. No sooner had we entered the area where we had decided to start looking for a viewing place, than we noticed a small clump of cars and trucks up ahead. We saw a couple of tents and campers on the hillside, then a group of 3-4 vehicles pulling off of the road together. Then we saw the outhouses. And a turnoff. And an unmarked campground. This was our spot! We were happily parked and eating breakfast by 9am. By the start of the eclipse, there were only about 20 vehicles nicely spread across the area. There was a rim of smoke around the horizon, but that, too, nicely cleared overhead in time for the show. The truly awesome part of being in the Totality Zone during a solar eclipse is that for a short span of time (in our case about 90 seconds) you can look at the sun with your naked eye. The body of the moon blocks out everything except for the stark white radiance of the sun’s corona. For the first half of the eclipse, the Earth slowly, imperceptibly, dims until the last few moments when it reaches a tipping point and you are suddenly plunged into a sunset-time of darkness. There were no stars in the dusky sky, but Venus appeared, shining brightly overhead. The corona was far from uniform, with three larger, asymmetrical rays streaming into the sky. Seen with the naked eye, the light and texture seemed almost ethereal. Almost Divine. I gazed openly at this sight, knowing it would end all too soon, and wondering if I would feel any kind of bliss or rush. Just the sight of this natural wonder in itself, and the changing view of the landscape around us, was worth the trip. Then I saw a tinge of orange at the trailing edge of the moon, and I knew it was time to put the safety glasses back on. Before I could get the glasses to my eyes, there was suddenly a burst of massive, bright white light from the upper edge of the corona. I immediately looked away, but in that instant I had felt a direct connection from the sun to me. Over the next couple of moments, daylight came back as quickly as it had left us just a few moments before. The Earth was flooded with yellow and the colors of life, and I found myself in an unexpected wave of emotion, fighting back tears. Every cell of my body was saying, “I love the Sun. I love the Earth. I love life on this planet; it is such a gift.” This was the rush and the bliss. So surprising and primordial. The day after we got home from the trip, I settled down to focus on the business of my shamanic practice and my upcoming teaching and writing for the fall. Everything fell into place. I was more productive in my first week of work than I had been all summer. I was truly walking in both worlds – both inspired creatively and with the ability to complete my work in ordinary reality. So far, this hasn’t stopped. The nearest parallels to this experience I can make are dying and being resurrected. Being abandoned and reclaimed. Adjusting to living in semi-darkness, then being reminded what it is like to live fully in the light. At the most instinctual level, I know we are okay. There is light and color all around us. The patterns and power of the Universe remain. We belong. We are loved. This entry was posted in Being in the World. Bookmark the permalink.